"A moment lasts all of a second, but the photograph tells a story forever"
An album is a family heirloom; lasting for generations to tell the stor yof the beginning of your lives together. It will house all the photographs of your family, the moments between the moments of smiles and laughter and iconic and stunning portraits of the two of you together. Albums can be invested in during the initial booking or anytime after; we invite you to come into the studio for an album consultation where you can touch, feel and imagine your own wedding album through our samples. We can educate you on the album options, sizes, ranges, colors and assist you in creating the ultimate wedding album. It is hare to imagine what the perfect wedding album would look like; after all you have probably never designed a wedding album before, know how it would look best or understand how your retouched images will change the design, layout and style of the album. We are here to help. In every way possible. In our opinion a CD of images is nice; but to have a generational heirloom, that you will look at over and over to relive your wedding day is to have a wedding album. Let us assist you in creating the perfect wedding album for you and your families. For many including us is is hard to understand exactly how many pages, size, style or options would be best for your wedding album before the wedding has even been captured. Therefore we have Album Credits that can be used to purchase albums or Starter Albums that have forty pages and can be increased from there. 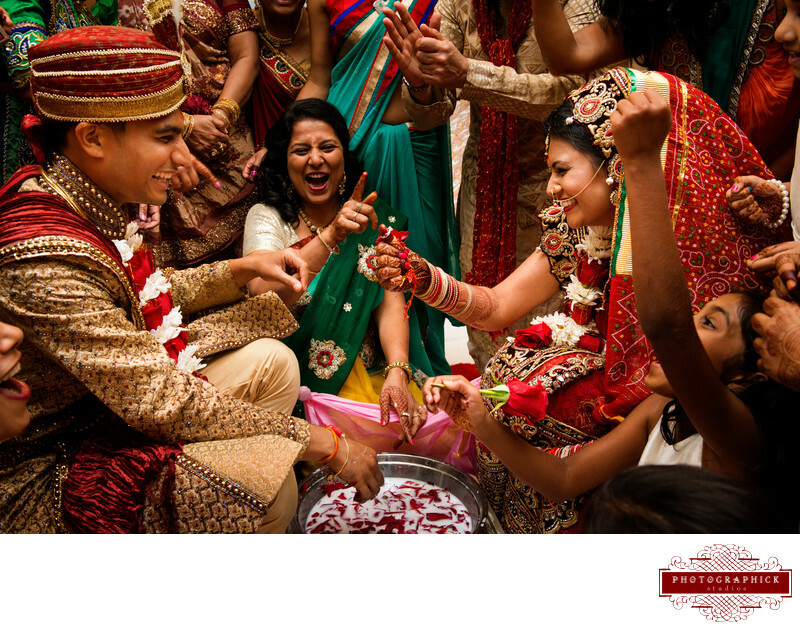 Forty pages is what a South Asian Wedding needs at a minimum but can be upgraded from there based on the breadth and extent of events and wedding coverage. Many of our clients intent of budgeting before the wedding or looking for a deal can pre-purchase album pages in an effort to save money as purchasing album sides before the wedding allows you more pages for a lower pre-wedding price. After your wedding we will have hundreds if not thousands of images; for you to go through all those images to pick your favorites is difficult. After all you will probably fall in love with most if not all the photographs. We will pre-design the album based on the story of the day - the story that best depicts the love, laughter, family and friends that made your once in a lifetime event unforgettable. We will design based on what we think tells the best story from your wedding weekend and then from there you are welcome to make any changes, edits or updates you would like. This allows us to use our artistic skill, our design background from creating hundreds of albums and the mental storyboard of your wedding weekend to create a stunning wedding album design that you can update. Our goal is to make it easy for you to relive your wedding weekend while creating a timeless keepsake that will be passed down from generation to generation. Upon finalizing the album design our team will retouch the album pages; our goal is to ensure each photograph looks it's absolute best and tells the best story as a finished product. Included int he cost of every album is the retouching of spreads.